The red marble of Vitrolles is extracted in France in L’Etang de Berre in the Department of Bouches-du-Rhône in Vitrolles. It is also called Etruscan Red because it vaguely recalls the particular red color of the polychromatic clay Etruscan vases discovered in the Vulci excavations. This material from the Paleocene Era (from 65-58 million years ago) is composed of argillaceous limestone rich with MICROCODIUM—fossils made up of tiny limestone prisms no larger than 1-2 mm. 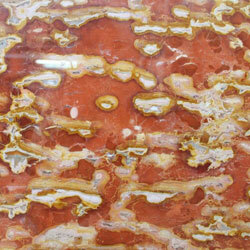 This marble with its shiny red background is studded with oblong spots with a golden yellow and sometimes dark yellow border and of a pinkish white color on the inside. Once the slab has been sawed, the large winding ovals look like silver snails with golden shells. This particular texture resembles the veins in Onyx marble. The produced effect is of extraordinary and rare beauty. The “Vitrolles” marble obtains an excellent shiny finish, is easily processed and is particularly suitable for interiors and high quality finishes.